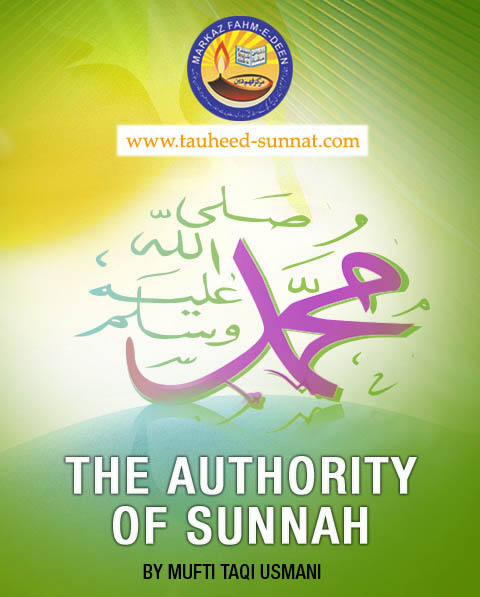 Description : The Authority of the Sunnah - By Mufti Taqi Usmani - The Sunnah of the Holy Prophet Muhammad (Sallallaho Alaihe Wassallam) has been accepted as an important source of Islamic law, next in importance only to the Holy Qur’ân. This status of the sunnah has remained unchallenged and undisputed throughout the centuries. There have been many differences among Muslims in their juristic opinions, but the authority of the Holy Qur’ân and the Sunnah of the Holy Prophet () was never denied by any jurist. Leaving aside some scattered individuals who separated themselves from the main stream of the Muslim population, nobody has ever refused to accept the Sunnah of the Holy Prophet (Sallallaho Alaihe Wassallam) as a sacred source of the Islamic law. Details | JUSTICE MUFTI MUHAMMAD TAQI USMANI is one of the leading Islamic scholars living today. Author of more than 40 books, he is an expert in the fields of Islamic law, Economics and Hadith. For the past 40 years, he has been teaching at the Darul-Uloom in Karachi that was established by his father Mufti Muhammad Shafi, the late Grand Mufti of Pakistan. He also holds a degree in law and has been a Judge at the Sharia Appellate Bench of the Supreme Court of Pakistan. He is a consultant to several international Islamic financial institutions and has played a key part in the move toward interest free banking and the establishment of Islamic financial institutions. He is the deputy chairman of the Jeddah based Islamic Fiqh Council of the Organization of Islamic Conference (OIC). 15. Does the Holy Quran Need Explanation? 30. Comparison with other narrations: The third test applied to a tradition relates to its comparison with what is narrated by other pupils of the same teacher.